This article is about mechanistic circular causality. For performance feedback, see performance appraisal. For educational feedback, see corrective feedback. For other uses, see Feedback (disambiguation). Maintaining a desired system performance despite disturbance using negative feedback to reduce system error. "Positive feed-back increases the gain of the amplifier, negative feed-back reduces it." Feedback is an also useful design principle for designing user interfaces. When stocks are rising (a bull market), the belief that further rises are probable gives investors an incentive to buy (positive feedback—reinforcing the rise, see also stock market bubble); but the increased price of the shares, and the knowledge that there must be a peak after which the market falls, ends up deterring buyers (negative feedback—stabilizing the rise). Once the market begins to fall regularly (a bear market), some investors may expect further losing days and refrain from buying (positive feedback—reinforcing the fall), but others may buy because stocks become more and more of a bargain (negative feedback—stabilizing the fall). ↑ Andrew Ford (2010). "Chapter 9: Information feedback and causal loop diagrams". Modeling the Environment. Island Press. pp. 99 ff. ISBN 9781610914253. This chapter describes causal loop diagrams to portray the information feedback at work in a system. The word causal refers to cause-and-effect relationships. 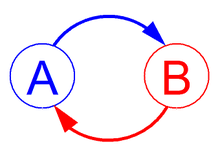 The word loop refers to a closed chain of cause and effect that creates the feedback. 1 2 Stuart Bennett (1979). A history of control engineering, 1800-1930. Stevenage; New York: Peregrinus for the Institution of Electrical Engineers. ISBN 0-906048-07-9. 1 2 3 Arkalgud Ramaprasad, "On The Definition of Feedback", Behavioral Science, Volume 28, Issue 1. 1983. Online PDF last accessed 16 March 2012. 1 2 David A. Mindell (2002). Between Human and Machine : Feedback, Control, and Computing before Cybernetics. Baltimore, MD, USA: Johns Hopkins University Press. ↑ Friis,H.T., and A.G.Jensen. "High Frequency Amplifiers" Bell System Technical Journal 3 (April 1924):181-205. ↑ H.S. Black, "Stabilized feed-back amplifiers", Electrical Engineering, vol. 53, pp. 114–120, Jan. 1934. 1 2 Maxwell, James Clerk (1868). "On Governors" (PDF). 16. Proceedings of the Royal Society of London: 270–283. 1 2 Snelgrove, Martin (2011). "Oscillator". McGraw-Hill Encyclopedia of Science and Technology, 10th Ed., Science Access online service. McGraw-Hill. Retrieved March 1, 2012.